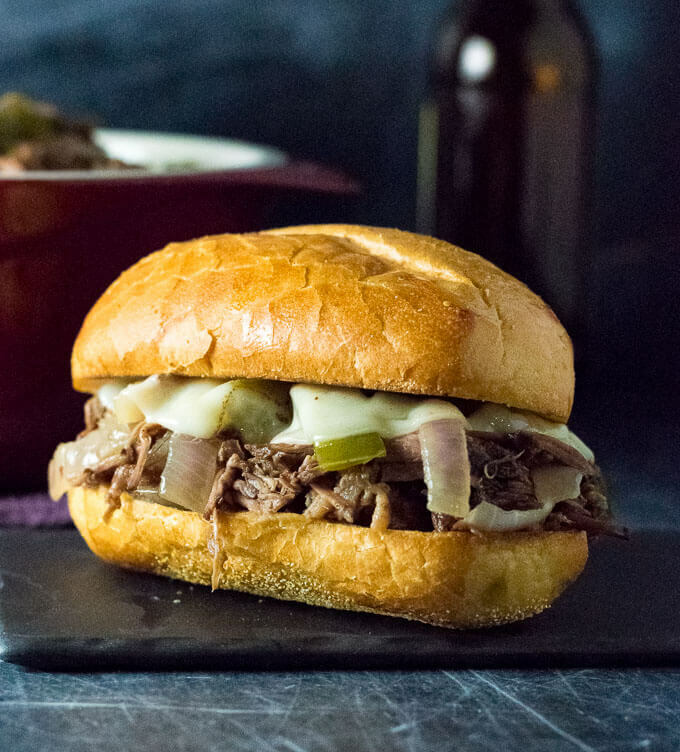 These Shredded Slow Cooker Philly Cheesesteaks pack all of the big beefy flavor of real Philly cheesesteaks, with none of the fuss. I love Philly cheesesteaks almost as much as I love my wife. However, I have never gotten into an argument with a cheesesteak, nor has it bugged me to mow the lawn, so there’s that. But I guess a cheesesteak has never given me a hug or bore my children. Hmm… it is just so close. Like being married, the problem with Phillies is they are so dang complicated to do well. Making a good traditional Philly cheesesteak at home is not a simple task. You need to get a mandoline slicer, partially freeze the meat, slice it paper thin, etc… It is rarely worth the hassle. 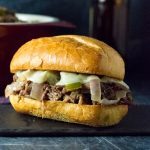 Instead, I decided to come up with my own recipe to replicate the traditional taste of a cheesesteak in a slow cooker, and I think I nailed it! Traditionally a Philly cheesesteak is made with thinly sliced ribeye steak. However, that is way too nice of a cut of beef to use in the slow cooker. You would be throwing away money. Instead, use chuck roast for the slow cooker. It is a much cheaper piece of meat with a similar fat content, and it will render down to be exceptionally tender after sitting in the slow cooker all afternoon. When choosing a cheese for topping your Philly, I always recommend Provolone. It just tastes the best. However, if you are a Philly purist you can certainly make your Philly Cheesesteak with Cheesewiz instead. However, if you are a Philly purist you probably won’t be using a slow cooker. You will notice my recipe has you wait to put the onions and peppers in till near the end. If you put them in right away they will not only be mushy, but the green peppers will lose a lot of their flavor. I recommend putting them in the slow cooker 30-60 minutes prior to serving. I think 45 minutes prior is the sweet spot where they are perfectly tender, but still retain a little crunch. If you are looking for a good slow cooker, I really like the Crock Pot brand. I don’t think you need to spend a lot of money to get a quality slow cooker, simply look for one with a “High”, “Low”, and “Keep Warm” setting. Bonus points if the slow cooker has a locking lid like this one. The above are affiliate links. Any Amazon purchases made through these links help support FoxValleyFoodie.com at no additional cost to you. Add chuck roast, beef broth Worchestershire sauce, salt, pepper and garlic powder to the slow cooker. Cook on high for 5 hours, or until meat is easily shredded with a fork. 45 minutes before serving add onions and green peppers to slow cooker. This can also be done when meat is starting to become shreddable but is still showing some resistance (4-5 hours into cooking). Place meat, pepper, and onions on hoagie rolls and top with Provolone cheese. The heat from the meat should melt the cheese, though you can also use your oven to do so if needed. Slow cookers cooking temperatures are notoriously inconsistent from household to household, so total cooking time can vary. Keep cooking until meat is easily shredded with a fork. 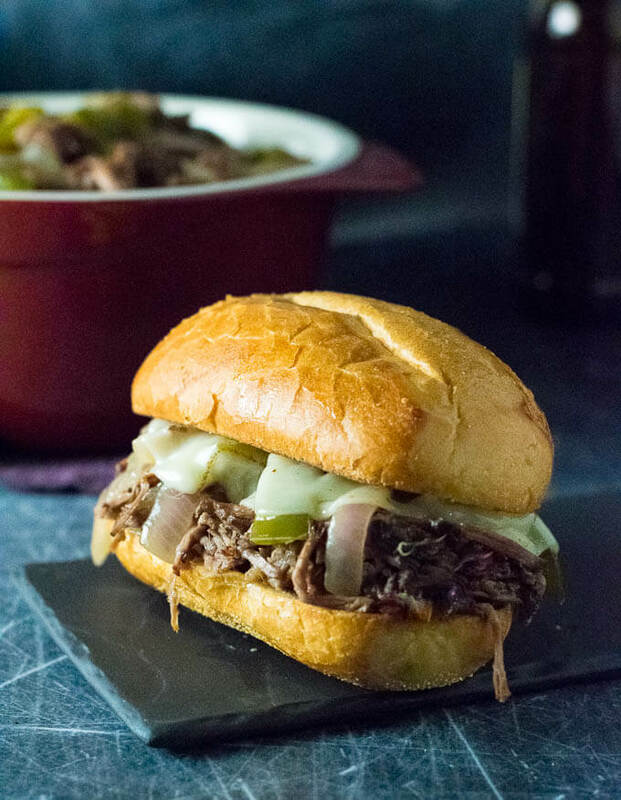 IF YOU LIKED THIS RECIPE you will love my Crock Pot Italian Beef Sandwiches - Chicago Style! 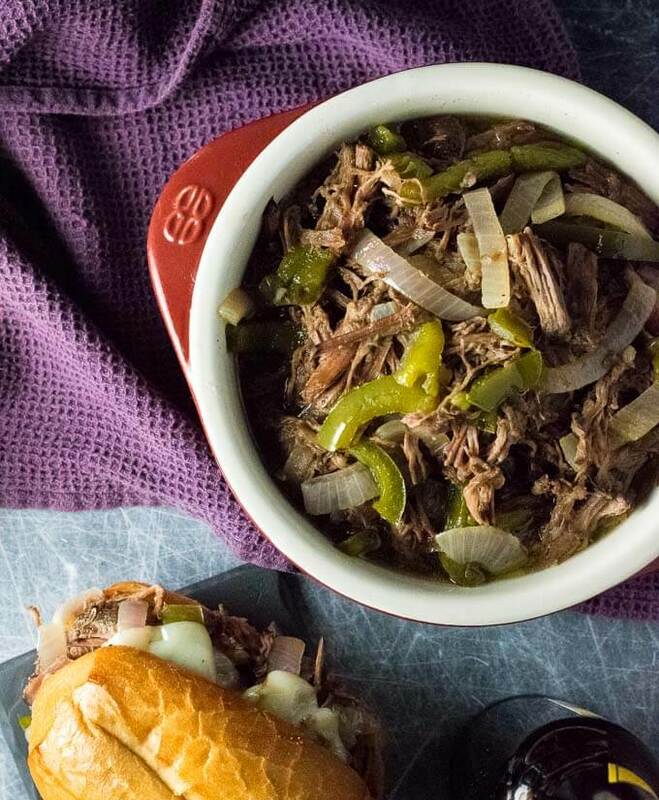 If you enjoyed my Shredded Slow Cooker Philly Cheesesteaks recipe then you should probably like me on Facebook and follow me on Pinterest too. That’s what I would do at least, because if you don’t get to know me but you still use my recipe it is kind of like taking candy from a stranger, and your mom taught you not to do that. Don’t disobey your mom, subscribe to Fox Valley Foodie today. This looks like a tasty lunch or dinner. Can I cook it on low? My slow cooker always burns things on the high setting. How long would you recommend 7- 8hrs? BTW-love your recipes, the family is enjoying my discovery of your site. Yes, you can cook it on low. 7-8 hours should be good, but let the meat be your guide. When it is easily shredded it is done. If it is still tough, let it cook longer.